Court records surrounding GOP Treasurer candidate Walker Stapleton’s DUI hit and run are in conflict with the candidate’s explanation of the accident. 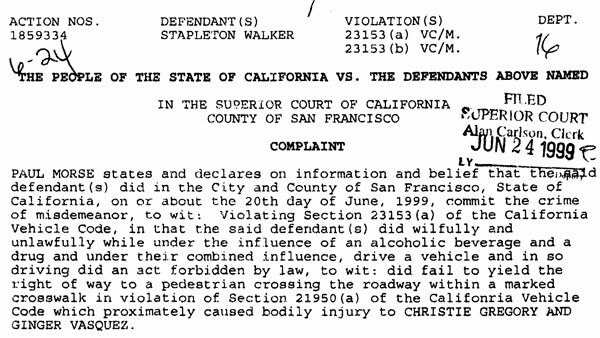 Stapleton in September admitted that he had a DUI in San Francisco in 1999. Stapleton downplayed the incident during the September debate. He told the Denver Post that a cab ran a traffic light and hit him. · Why did the SFPD charge Stapleton with DUI, hit and run and hitting pedestrians? · Why were the charges amended a month afterward to include leaving the scene of an accident without giving aid to the injured women? · Why did he not mention that two people were injured as a result of the accident? · Is he blaming the victims when they don’t have any ability to tell their side of the story? San Francisco Superior Court records indicate that Stapleton was charged with DUI, and hit and run. A third charge of failure to stop and give aid to the injured women was added a month later. Stapleton pleaded guilty to DUI and served community service. Here are the court records of the case as forwarded by Strong Colorado. There does appear to be a major gap between what Stapleton disclosed about this incident and the facts. In our experience, that tends to create a problem for aspiring candidates much worse than the bare facts themselves. Which is not to understate those worsening bare facts. Pretty much any way you look at this, it’s really bad for Stapleton–the words “race-ending” seem perfectly appropriate. Denver, CO – Over the past several weeks, two different blogs have reported two very different accounts of a DUI traffic incident involving GOP candidate for State Treasurer, Walker Stapleton. I’ll be voting for at least Republican, maybe two. I voted for our Republican sheriff. All hands down superior candidates. Most important, not nut jobs. See, I’m not a blind ideologue. a family that leaves a lot of damage in its wake and never has to suffer much in the way of consequences. Guess the help cleans up the messes. Running a couple of people down like dogs and then leaving them bleeding by the side of the road as you make you escape points to far greater personal flaws. The flaws are feelings of superiority and entitlement and a complete lack of human empathy. Much like his cousin George W Bush, he shares a sense of entitlement and lacks even a modicum of empathy. I agree that it is genetic – the same roots that helped Grandpa Ben fit into a Klansman’s robe so easily. Stapleton’s campaign has been a fact free abomination, and he makes me sick. This just adds to the disgust. And what the hell is it with the Republican party that they can’t find and vet a few good candidates? Aaargh. The idea that this race is close is laughable. Yet Republicans want him to run our state finances? Although 26 seems a bit old to me. I wonder how loaded he was. I see the .20 (or whatever) box isn’t checked, but not an actual number. (Or maybe they didn’t catch him soon enough?) How drunk would you have to be? because my opponent hasn’t spent a day of her career outside of government and I haven’t spent a day of my career inside of government. Otherwise it’s just inside baseball. That is exactly the kind of stuff that the media and the average voter respond to. If this doesn’t get into the the MSM in a big way, what difference will it make? Cary Kennedy has great potential star power and is very smart, highly competent, knows how to get the job done, good communicator. Should have bright future. the former President, have a problem with alcohol. Laura Bush ran somebody over too, so I’m sure Stapleton just expected it to go away. You guys just cant help yourselves. Is everyone who was so quick to write pithy comments talking about Stapleton hitting pedestrians going to be just as quick to admit they were wrong. Hoover from the Denver Post reports Stapleton DID NOT hit a pedestrian-confirmed this with the SFPD-Stapleton was telling the truth. Maybe CoPols can update their BS Story and say they were a little quick to simply reprint some liberal group’s propaganda. Let’s see if this site is biased or not. can square one current officer’s assertion that no pedestrians were involved with the report from that time that he “did fail to yield the right of way to a pedestrian crossing the roadway in a marked crosswalk… causing bodily injury” to two persons. GOPweenie’s new sockpuppet, do you see the screenshot of the court report up there? I know of ONE person who can “verify” that the printed record is not correct. Bring on George Walker Bush Stapleton, and let’s have him explain why this court document is wrong. Huh? Huh??? JEEZ, a perjurer can be trusted with a ton of money. They’re totally honest! Why do the GOP shills insist on making everything worse? This race should be over. In any other year Ken Buck wouldn’t be credible either. Ethically challenged attornies are a dime a dozen. One that gets ordered into classes is rare.